If you own a business with block concrete surfaces such as parking garages, concrete overpasses, and footbridges, you have expansion joints that need periodic attention. What’s an expansion joint? It’s material placed between the concrete slabs that contracts and expands as the temperature changes, acting as a shock absorber to absorb stress from the concrete slabs’ movement. Over time, expansion joints can dry out and lose their ability to perform as intended. With the loss of the ability absorb pressure and tension caused by expansion and contraction, the concrete slabs can start to chip and crack. When this happens, it’s time to replace those expansion joints and make repairs. 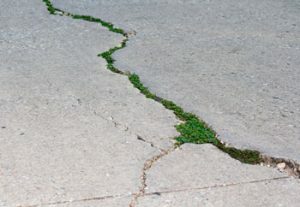 Your best option is to get proactive and inspection your expansion joints before they fail so that you don’t end up with damaged concrete that also needs to be replaced. The trick is knowing what to look for. Clean any loose dirt and debris out of the joint. Dig out and remove all the old joint material and flush out any remaining debris with a hose. Finish cleaning out the joints between the slabs thoroughly with a wet-dry vacuum. Apply a bonding adhesive in the joints with a brush — this will help the new material to bond to the old concrete. Let the adhesive dry for about 10-15 minutes. Don’t go any longer than that because the adhesive should be sticky to touch and not completely dry. Insert a foam backer rod. This will be your new shock absorber. Cut to length and push the strip completely into the joint with a putty knife. Cover and seal the joint. Apply a liberal layer of self-leveling urethane sealant. It’s recommended to wear safety goggles and gloves when applying urethane sealant. Block off the area until the sealant has dried. Concrete expansion joints are a critical element in many different concrete structures, so make sure you inspect them regularly and take action when needed to ensure proper function and long life. ← What Exactly is Decorative Concrete ?